Over the past few months I have been busy on the conference scene. Starting back at the end of March was the National Congress on Rural Education held yearly in Saskatoon. I was involved in two presentations related to research in a rural Manitoba School Division. In April was AERA in Chicago - the biggest education conference in the world. This year was my first attending. In June it was CSSE at the University of Ottawa. Presentations at the last two conferences also centred on the aforementioned research - part of BU's SSHRC funded VOICE project. Finally, last week I attended the Social Media and Society Conference at Ryerson University in Toronto. The last conference I presented a poster (on my dissertation work) and another poster with a colleague about our self-study work concerning using SoMe in teacher education. While I enjoy doing posters, the main reason for that was that I did not hear of the conference until paper deadlines were past. By the way, most of my presentations can be found on my slideshare page. So, a whirlwind of travel and presenting - why do I bring these up? Well, I find it interesting to compare the conferences and which ones I go the most out of and found most enjoyable and useful. National Congress - focus on rural education, attendees include a range of people: senior division admin, school admin, teachers, trustees, parents, and a student journalism group reporting on the events. AERA - huge! very international, yet sessions are for the most part a U.S. focus (obviously). I found most paper sessions rather boring and generally slide presentations were not good. I enjoyed the city of Chicago, the round table and poster sessions I attended - perhaps because they are more like discussions. This was the least useful conference I attended. CSSE - this was also big. Participants are generally from across Canada, and it is held in conjunction with all social sciences (SSHRC). The focus was Canadian, so thus it was more useful than AERA. For the most part, presentations were very interesting, and there were other events - big keynote speakers and a wonderful contest of 3 minute presentations by SSHRC funded graduate students - "SSHRC Storytellers" - one presentation was delivered as 'slam poetry' - awesome! 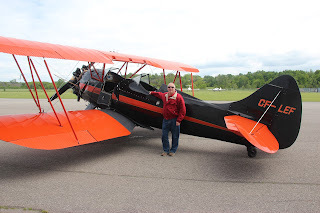 Of course, being in Ottawa, I had the opportunity to spend time at the Space and Aviation Museum and take a flight in a 1939 vintage open cockpit biplane (personal passion!). Social Media & Society - this conference was my overall favourite. I met several people - people I knew through twitter and more that I added. The conference was very international and interdisciplinary - this might be why it was so interesting. I have a passion for studying social media in education and this conference reinforced that passion - perhaps rekindling it! It was an interesting location right in the heart of downtown Toronto. Ryerson has an amazing student learning centre we toured as well. See the tweets at #SMsociety15. I plan to attend next year's conference to be held in London, UK. Looking forward to it (of course that means I can visit my daughter who lives there, as well!). So, conferences are varied and one can get something of value out of just about any - I have ideas, met people, and learned at all of them. I also found that I like poster and round tables - seen as the poor cousins of papers - but they are also rapid and more like conversations. I know one shot deals are not always optimal for learning, but these conferences do have their role to play, especially for academic work - a place to share, meet, and plant some seeds. PS - me and the 1939 WACO biplane!